The UBC women’s hockey team has made UBC playoff history again, and the postseason action hasn’t even started yet. Finishing in second place for the first time in the Canada West conference, the ‘Birds will be playing on home ice against the Manitoba Bisons in the semifinals of playoffs. After an early exit from the playoff series last year in the semis, the Thunderbirds have taken the experience in their stride and are looking to do better this year. This year UBC fought hard for an extra week off. The Manitoba Bisons will be coming in from a tough game against the Regina Cougars, who they eliminated from playoff contention in a best-of-three series last weekend. In the regular season, the ‘Birds fell to the Bisons in Winnipeg twice before beating them in a home-weekend sweep later in the season, which gave them the bye week and second place in the league. Now, they’re looking to do it again. Both teams now boast newly-selected Canada West All-Star Team members. UBC’s own Sarah Casorso was named to the first team, whilst teammates Tatiana Rafter and Nicole Saxvik were named in the second. This is the second year that Casorso and Rafter have had conference honours. On the other side, Manitoba’s rookie forward Alanna Sharman was named to the first team alongside Casorso, who leads the league with 17 goals and 23 assists, and was named Canada West’s rookie of the year. Bison defenseman Michelle Pawluk and goalie Rachel Dyck were also named to the second all-star team. Dyck is third in the league with a save percentage of .927, only .005 less efficient than UBC’s own Samantha Langford. Manitoba fought hard in their opening weekend, scoring on six out of 16 power plays in three games, and will be a tough opponent for the ‘Birds. If that wasn’t enough for outgoing seniors Casorso, Rafter and Nikola Brown-John, the pressure is on in, with this being their last playoff series. Casorso returns from her University Games experience in Spain, where she helped Canada win the silver medal. For the team, preparation and desperation go hand in hand when facing a team like the Manitoba Bisons. “We need to make sure that we’re practicing really hard this week and preparing and training and getting ourselves ready to go for the weekend,” said Thomas. “We made some good decisions and committed to the team, and we’re getting better and more prepared for this weekend, taking care of our bodies, our academics. 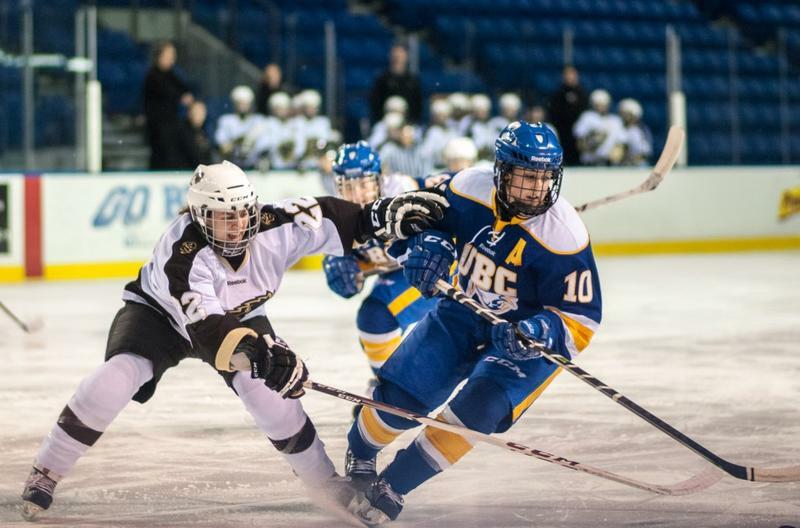 The UBC Thunderbirds will be playing on Friday and Saturday night in the Father Bauer Arena in the Doug Mitchell Sports Center at 7 p.m. and 3 p.m., and if necessary on Sunday at 3 p.m. in a best-of-three series.